Mix with Evergreen for amazing results! My son Jesse Walker, photo taken in Grand Cayman Islands. We drink this every day in the hot weather, mix a vial with Evergreen and Sunrider Stevia and Fortune Delight. Delicious and so refreshing! Electrosport is the most Alkaline formula we have in Sunrider. This formula is especially formulated for the physically active. During periods of high temperatures when bodily fluids and electrolytes may be depleted through perspiration, this liquid herb concentrate is a vital component of any fitness, athletic or nutritional program. Can prevent dehydration and heat exhaustion – great for people whose job requires that they be in the sun all day, like construction workers and farmers. Because it is an ionized solution containing no sugar, sweeteners, preservatives or artificial ingredients, this formula acts quickly in the body and electrolytes can function unimpaired. This formula enhances the value of all the other Sunrider products. Nutrition is carried deep into the cells and toxins are carried out. • Most popular forms of mineral supplements today are indigestible by the human body. Available in packages of 10 vials to the pack. Once opened, the vial should be consumed within 24 hours (keep in the fridge when opened). One vial is very concentrated – NEVER drink this liquid straight from the vial. By the way, almost all Sunrider products are DELICIOUS. However, this vial is the exception and has been described as – “it comes in a vial, and it tastes vile!”… Yes, by itself is not very tasty. Minerals never are. But especially when they have been put through Dr. Chen’s special enhancement and concentration processing. It is very beneficial, but not good-tasting!! You can see for yourself the immediate effect when added to one of Sunrider’s herb food beverages. 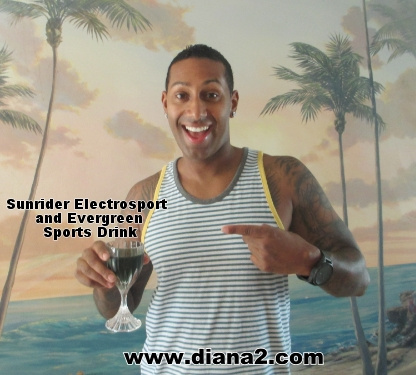 As you pour the clear Electrosport liquid into the beverage, the beverage will darken as the the minerals binds with the food particles contained in Sunrider herb foods. This binding process helps the body to better utilize the components of this amazing formula. Success Story #2 – Louise was able to overcome vertigo. The doctor had told her it would take months. Louise drank 1 vial Electrosport, 1 vial Evergreen, 1 vial Vitafruit, 1 package of Fortune Delight, plus Suncare (Sunrider Stevia), in 1 quart of water, daily and the problem cleared up within 10 days! Spring is nature’s season of renewal. Recharge and replenish your body with this potent Sunsport® product. Designed for people with active lifestyles, this supplement infuses the body with what it needs to function at optimum efficiency, and its small size makes it easy to carry when you’re on the go.